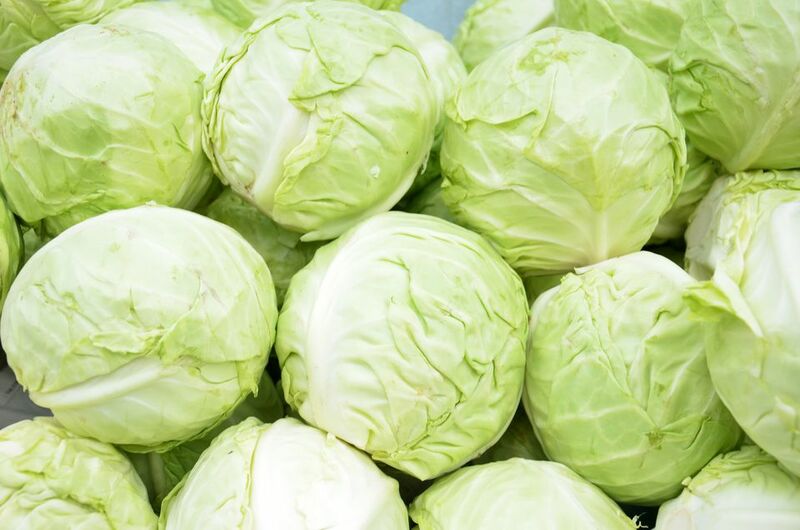 Cabbage, although generally considered a cool- or cold-weather vegetable, is available year round, which makes it easy for you to pick up ahead and put it on your menu. Whether you are looking for an entree, a side dish, or just a snack, each type of cabbage—red, green, savoy, bok choy—offers a slightly different taste and texture, so do not be afraid to experiment. By following a few cooking and presentation tips, cabbage can become a favorite in your household. When selecting cabbage at the store, there are a few things to keep in mind. Look for heads with plenty of outer leaves, and check the bottom to make sure the leaves are not pulling away from the stem. Red or green cabbage should be tightly compacted, and when you lift it, it should feel heavier than it looks. For leafier types of cabbage, such as bok choy or napa, choose a cabbage that is green with firm stems. Because cabbage can contain pests hidden in the leaves, it is important to wash your cabbage before using it either raw or cooked. Run your cabbage under cool water before starting your favorite recipe, just to be on the safe side. Cabbage can be steamed, baked, braised, sautéed, or stuffed. Many cooks prefer to trim away the bitter white core of the cabbage before shredding or cooking. If you need the leaves whole to stuff, you'll find it easier to separate them if you core the cabbage and plunge the head into boiling water for 1 minute. Drain well, blot dry, and proceed to separate the leaves. Repeat as necessary the closer you get to the center of the cabbage. Cabbage goes nicely with herbs such as celery seed, mustard seed, nutmeg, savory, tarragon, garlic, caraway seed, dill weed, black pepper, and thyme. You can also mix it with cooked pork, ham, or sausages to make the French choucroute. It is also the basis for sauerkraut and coleslaw. You can even eat your cabbage raw as a snack. As a general rule, allow 1/4 pound of cooked cabbage per serving. A medium head of cabbage is about 2 pounds. If you slice and dice your cabbage, 1 pound of the raw vegetable converts to 2 cups cooked. When planning a menu that includes cabbage, consider vegetables such as potatoes, leeks, onions, and carrots, as they are good companions. Cabbage also pairs beautifully with corned beef, bacon, and sausage. Cabbage can make an attractive presentation when it is used raw. You can use red or purple cabbage leaves to hold side dishes or salads on the plate for an attractive and colorful accent. Cabbage heads can be hollowed out and used as serving containers for cold dips and spreads. Red and purple cabbage heads also make excellent centerpieces. While you will not necessarily find cabbage listed as a synonym for health food, perhaps you should. This vegetable is an excellent source of Vitamin C and Vitamin K, as well as magnesium, manganese, and folate. Cabbage also contains phytochemicals, which are believed to help protect against breast, colon, and prostate cancers, and can help reduce LDL otherwise known as "bad cholesterol."